You are at:Home»Blog-News U can Use»Do You Know the Difference Between Strategic Sourcing and Category Management – How Many Chevrons Are In Your Process? 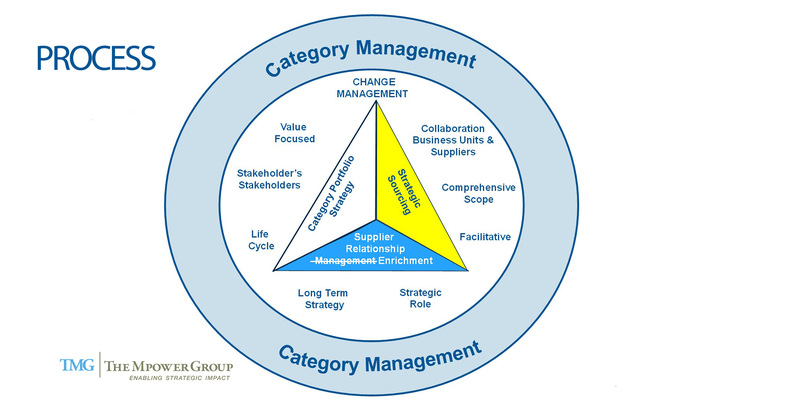 Do You Know the Difference Between Strategic Sourcing and Category Management – How Many Chevrons Are In Your Process? Process is highly overrated in terms of the effectiveness and efficiency of a Procurement/Supply Chain organization and by that, I mean, the design, details and number of chevrons in that process. Yet, many a time we have clients clamoring for a new process, asking how that’s going to solve world hunger and our answer is always the same: Forget about the number of chevrons, sub steps or tools in your process and focus on the adoption. A substandard process that has higher adoption will always out perform a phenomenal process that has lower adoption. It is the same story as you move from Strategic Sourcing to Category Management and we will be discussing the domain of Process in the next webinar in our series “The Journey from Category Management to Strategic Sourcing ” on August 22nd. Focus on the process means investing time and energy on the “content” when in fact the transition to Category Management is much more about a focus on the “context”. The process does change quite dramatically to ensure that the focus is on Context. Focus is on Value Creating: The process undergoes a fundamental shift to place significantly more emphasis on Value (as defined by the stakeholders and not by us!). Stakeholder Engagement is far more critical: The engagement with stakeholders becomes paramount and inclusion becomes the norm. The focus on their stakeholders is what starts changing the context and drives much higher credibility for our function. Process integration: The level of integration with internal processes (S&OP, NPD, CAPEX etc.) becomes a necessity to deliver the benefits of Category Management. The deliverables of each one of these processes is dependent on Category Management and those process owners know that. The integration does not stop there but also extends to supplier processes (their S&OP; Cost management,etc.). Category Management drive collaboration: It is hard to argue that even the most sophisticated sourcing processes were not always adversarial in nature. By the way, they were adversarial both with suppliers and internal stakeholders. That’s why we always had high levels of resistance. 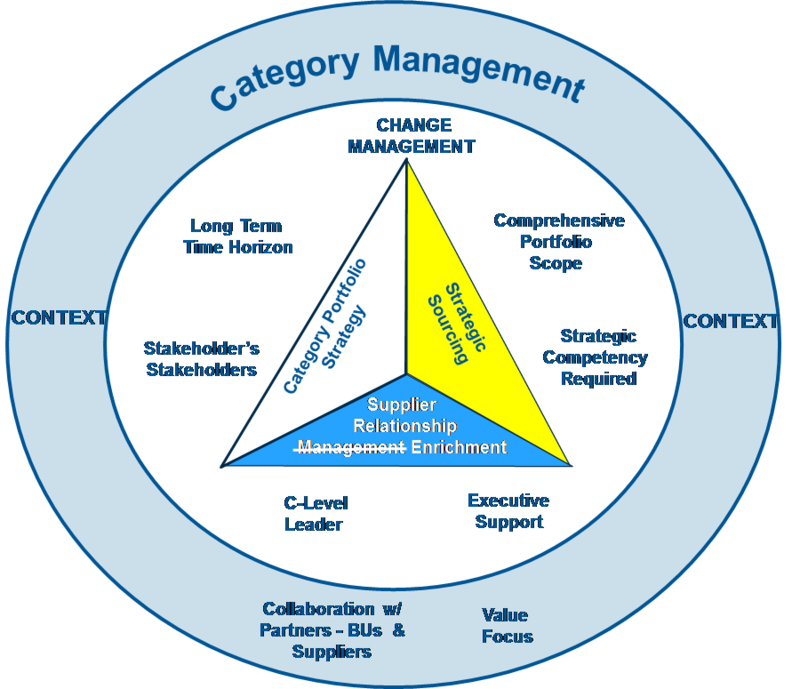 Category Management processes are designed to achieve higher and higher levels of collaboration both internally and externally. These are but some of the attributes related to process under Category Management. No discussion on this topic would be complete without acknowledging the role that Strategic Competencies play in implementing the new process. Without these competencies, achieving any level of Adoption or benefits is highly unlikely and this is a trap that we find a number of our clients in. They have made the decision to implement Category Management, have developed a new process and tools to support that implementation and then have gotten more and more frustrated when the results don’t start showing up. Part of the blame lies with our colleagues in the consulting community who have sold high priced engagements without alerting the client to this uncomfortable reality. Success in Category Management can never be achieved with a new process and a shiny set of tools with the level and set of competencies that existed before. While this does not at all mean a wholesale change of the members of an organization, it does mean a wholesale change in their competencies – especially the Strategic competencies. We will discuss this topic in depth later in the webinar series so stay tuned. Of course you will need to change your process to make your transformation to Category Management but you should put much more focus on adoption and also please remember that you will need much more Strategic competencies in your organization to achieve a successful transformation. Dalip Raheja is President and CEO of The Mpower Group (TMG). Dalip has over 30 years of experience managing large organizations and change initiatives. He has worked across the spectrums of supply chain management, strategic sourcing, and management consulting. Next Article Negotiating Styles – Which One Works Best?